Zaruba (undisclosed) was waived by the Eagles, Patrick Johnston of the Edmonton Journal reports. Analysis: The former rugby star was released by the defending champs after suffering a hamstring injury earlier in the preseason. Once healthy, the tight end may try to look for a spot on another roster or practice squad if he wants to keep his focus to football. Zaruba (undisclosed) cleared waivers and reverted to injured reserve, according to the league's official transaction log. Analysis: It still isn't clear what sort of injury Zaruba is dealing with. Barring an injury settlement, the tight end is nonetheless stuck on IR through the end of the league year. Zaruba (undisclosed) was waived/injured by the Eagles on Sunday. 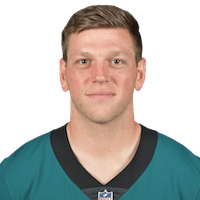 Analysis: Zaruba has been sidelined for almost a week with an undisclosed injury, and he will now revert to the Eagles' injured reserve after he clears waivers. Zaruba is not participating in Tuesday's practice due to an undisclosed injury, Dave Zangaro of NBC Sports Philadelphia reports. Analysis: Zangaro reports that Zaruba suffered the injury Sunday, but there still hasn't been any word on how severe it may be. Consider Zaruba day-to-day until the Eagles can provide an official update on the tight end's health. There are no videos available for Adam Zaruba. Click here to view all videos.